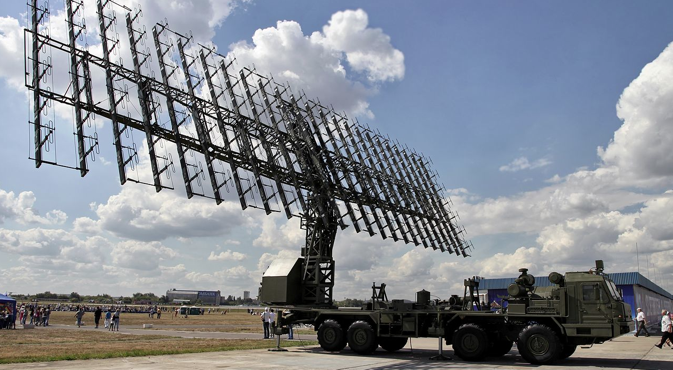 The Russian Aerospace Defence Troops have received the latest radar complex – the Nebo-M (Sky-M), the Ministry of Defence has announced. This powerful digital information system is designed for air defence combat missions and can be deployed in the Arctic, an emerging threat area for Russia. It looks like a fancy seeding machine, and can detect small and inconspicuous targets, including hypersonic ones and those made using stealth technology. Nebo-M (Sky-M) is designed for air defence combat missions and to provide radar support to anti-aircraft troops. The Nebo-M is fully automated, with digital information processing. When the complex detects a target, it is able to classify it on its own – whether it is a plane or a missile, and then transmit this information or the type of target to combat crews, or to the deployed air defence systems, for which the Nebo-M can serve as a pointer. KU RLK – control cabin of the radar complex with built-in secondary radar module (KVRL) on the BAZ-6909-015 chassis. For now, it is not known exactly where these radar systems will be deployed. However, one can assume that the Nebo-M will be sent to the Arctic. According to Sergei Grinyaev, General Director of the Center for Strategic Assessments and Forecasts, a new threat to Russia’s security is a possible military confrontation in the Arctic. One of the most dangerous areas that requires robust defence in Russia is in the polar latitudes. In addition, the ice cap allows for submarines, with nuclear missiles on board, to covertly reach Russia’s shores, the expert told RIR. The deployment of radar systems in the Arctic fully fits into the new goals and objectives of the adjusted Russian military doctrine. Russia has no plans to weaken its presence in that region, and this defence component will certainly not be the last element located there, said Grinyaev. Russia has already begun the deployment of aerospace defence forces in the Arctic and the construction of early warning radar stations in the Far North (in Vorkuta). Not so long ago, in the Arctic, the military has deployed new over-the-horizon surface wave radar – the Podsolnukh (Sunflower).